This black retractable stanchion w/dark green belt is a stylish crowd control barrier designed for use singly or as part of a set of line management posts. Each fixture is made from metal with an eye-catching wrinkle finish. The retractable stanchion w/dark green belt's 7.5' long fabric barrier is a contemporary-looking alternative to classic post-and-rope barricades. The 38" tall line post features a weighted 13.5" diameter base that provides stability in the heaviest foot traffic. 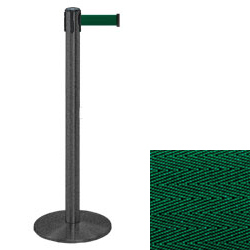 The sturdy stanchion w/dark green belt is easy to transport and store when not in use because the fabric barrier retracts into the line post's cartridge. 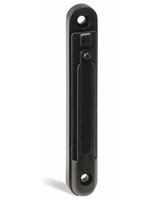 The 2" wide barricade is a modern-looking alternative to velvet or nylon rope configurations.